Intruder alarms are widely accepted as an effective deterrent against burglars. They provide a useful warning, limit theft of property and reduce damage to premises. We are pleased to say that, to date, we have not suffered a theft from premises where we have installed an alarm. An alarm system will usually consist of an alarm panel, a keypad, an outside siren with strobe light and a number of passive infra-red movement detectors or magnetic door contacts. You will receive a notification of when the alarm is activated either to your mobile or to a land line. We prefer to use GSM based communicators. At Farmwatch Ltd we prefer to program our alarm systems to contact you and your key holders direct. The police are extremely busy and you may get a delayed response, if any, to your alarm being triggered. This may be the case even if you pay the extra fees for a monitored alarm. At the completion of an installation we arrange a short training session to show you how the system operates. We normally use equipment from Jablotron for most of our new installations. The Jablotron Oasis will take up to 50 devices. The systems use a GSM based communicator, can contact up to 8 numbers by text and / or phone calls on activation of the alarm. 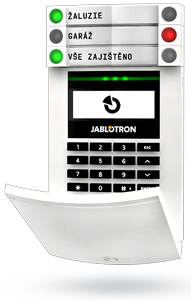 The Jablotron JA100 system can be split into 15 separate areas with up to 120 devices and up to 300 individual users. We install alarm systems in all types of situations from domestic dwellings, farm buildings and yards, churches to outdoor pig and poultry units..